What an evil curse upon the earth is litter. Thrown from the window of a moving car. Tossed on the ground at the city park. 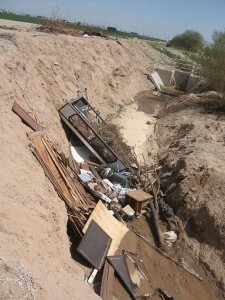 Dumped into the desert from the back of a truck. 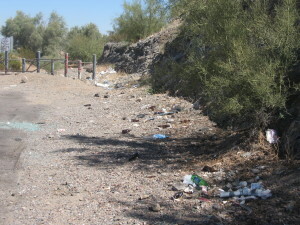 Litter is a most grievous blot upon the land, upon our waters. Litter grows. It multiplies. It’s ugly. It’s horrid. It’s sick. We’re sick, those of us who practice litter. We spew garbage upon our very souls. Once upon a time, we practiced keeping America beautiful. Now, we practice dumping waste, pumping waste, scattering waste. We eat waste. We drink it. We die with its mark upon our soul. The answer is simple. Pick it up. Pack it in; pack it out. Don’t dump. Keep America beautiful. Keep our earth beautiful. Keep your soul beautiful. I’m counting on you. You can count on me.